Who wouldn’t like to have a little extra time during this busy holiday season? With all the parties, decorating, family and friends visiting, gift building and buying, it seems like there is always something that needs to be done. 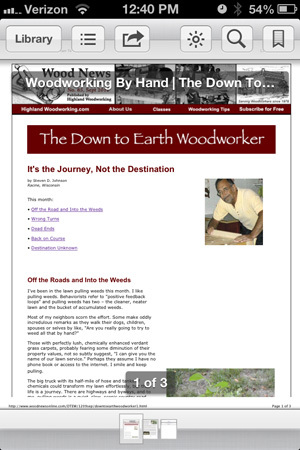 Well, just in time, the Down to Earth Woodworker is here to offer you a few quick time-saving tips for the busy woodworker. Time Saver #1: Put all your favorite DTEW columns on your smart phone so you can read them anywhere you encounter a long and boring wait! Take a look at more time-saving tips and more in the Down to Earth Woodworker column in this month’s issue of Wood News.